Landtoon is a roleplay world which players can enteract other peoples easily also I made this world for those peoples who have nothing to do. Last edited by Novuki; 04-14-2019 at 10:30 AM. After many days of searching for ideas to create a world. Finally, the EasterDayScene world is completed. It took ideas from Easter day event with lots of interesting details, the world is perfectly suited for everyone to have fun, entertainment. I hope everyone enjoyed it and have a great experience. - Colorful Rainbow Pixel Art. -Lovely Bunny Pixel Art With Parkour Inside. - Colorful Easter Egg Pixel Art With Parkour Inside. -You absolutely can finish parkour without wings or parasol. - Meaningful popular Images during Easter Day. My Friend first WOTD world, Its have nice parkour, Adventure Items, Story, Ghost Charms+All jammers. World name is GRAHTWOOD, And his story: Welcome to Grahtwood. Grahtwood is capital of aldmeri dominion. Altmers(elves) are living grahtwood. On the other hand, some daedras attacked to elves world and you are the choes. You have to save elves world. Also don't worry, Cadwell will help you! [GROWORIGIN] A tribute world to Growtopia and it's History. The world was made to showcase Growtopia's past and its growth over the past years its been released. Growtopia has many fun and interesting facts that very few players know and I have shared some of them in the world. and to also let older players reminisce in the past and remember all the good and bad things that have happened in growtopia. The world showcases Growtopia's mascot, Growtopia's logo and so much more. -and a growtopian quiz that will sure test their knowledge about the game. The world also has Growtopia's theme song. Most information sourced were taken for the Growtopia wiki website. Explore the world for yourself. Hello! I have an problem with renderworld! It not working. Rainy, cold, and there's no sun shining on the forest. Two adventurer found this tower and ruined, surrounding with flying bat and hanging thread from spider. The rune says, This tower has the owner was alive in beside houses. Just saying that named Roney, what they found a message inside house. ~Gravity Well, Death Trap wall, and other Adv. Items. ~Have a storyline (They're indeed). Damn, thanks for concerned the copy-paste thread. Bluragons can go anywhere, if i will on there, don't get surprised. ** April Fools in my religion is strictly forbidden! As some know, i am the biggest fan on Pixar movies, and the Toy Story movies are my favourite. I have built this world for WOTD and the upcoming Kyderby. Story : Isaac...is a talent, a talented boy that could make the world a better place. Unfortunately Isaac wasn't the nicest boy around-- honestly, that's a giant understatement...Isaac is the PINNACLE of ULTIMATE EVIL. Isaac seeks nothing else than destruction of everything. Isaac's talents range from being absurdly smart, to being good at literally everything he does. In this story - you are Isaac. You had a really abrupt plan to overthrow the developers of Growtopia, the plan was well-thought actually, yet it failed... The plan was to continuously defeat Devil Ham, actually, literally hundreds of times, and that way lure Almighty Seth out of his hiding place, and then instead of bluntly defeating him, TRAP him and hack the entire Growtopia. After defeating Devil Ham 1001 times, Almighty Seth was straight up infuriated, and attacked you out of nowhere. Everything went accordingly, but then something out of ordinary happen. Instead of trying to defeat you in a card game, he sent you to some sort of parallel alternative world, where everything is based of cards. It's unexpected, but you believe you can still find a way out, and overthrow Growtopia. The story revolves how you falter between good & bad, a backstory on how you became "evil," as people are not born evil - they become evil from their experience. The story is of course fine for both children & adults, but it does hold strong morality. There are 4 more parts of the story as long as this. I wrote it using my emotions, so I would like people to actually get there and read it. A word from the creator (IMPORTANT) : Unlike in GloomyMorning (my previous WOTD), I tried focusing on the parkour more than on riddles. Building unique parkours is a lot harder than building unique riddles I noticed, so building this actually took probably more than GloomyMorning... Well, the main struggle was world locks, as I was ultimately just broken, if I had more I could've made it way better. Honestly, I value GloomyMorning more than this, but I do believe that they're close to each other. When building I pour my entirety, so, the world is built by emotions rather than rationality - of course both are there. Both story and the parkour are built from my emotions, that's why I had no restraining, I didn't base it on "oh but bad parkourists won't get far," I just built it the way I want to, disregarding how difficult it probably is. Well, it's definitely easier than GloomyMorning, although GloomyMorning's difficulty revolves more around the riddles rather than parkour. In general this one is more of an eye-candy, and once played will probably just overwhelm you. Well design-wise, and how aesthetically pleasing both are; this one wins. I was motivated by rewatching "Avatar," not the movie, the cartoon, I watched it years ago as a kid, so nostalgia struckt me strongly. That cartoon based around "the four elements" which were water, earth, fire, & air. While "the four elements" in this game are different from that, still it works fine. The layout of this world is based on "Parkour" by Artemis, why I picked it like this? Because people that checked GloomyMorning judged it entirely from the beginning; the top, and that's a waste since most of my work went into the second half. Artemis' developed a brilliant layout for his world "Parkour," not only visually but also logically, since that way it reveals contents from all stages, and so that's why I used that layout. Well, overall this took over 50 hours to build, actually way more probably. The world has only 4 stages + 1 secret stage, except the first 4 stages are MASSIVE. The world has 10 riddles, all aren't very difficult, but are fun. The world has many unique parkour mechanics that are new to EVERY player, that's where I hold most of my pride in. Unlike GloomyMorning, this was already beaten, unfortunately it's not as difficult, and so there's no prize anymore, but it was 50 world locks. Amazing story about a pizzarunner and his adventures! 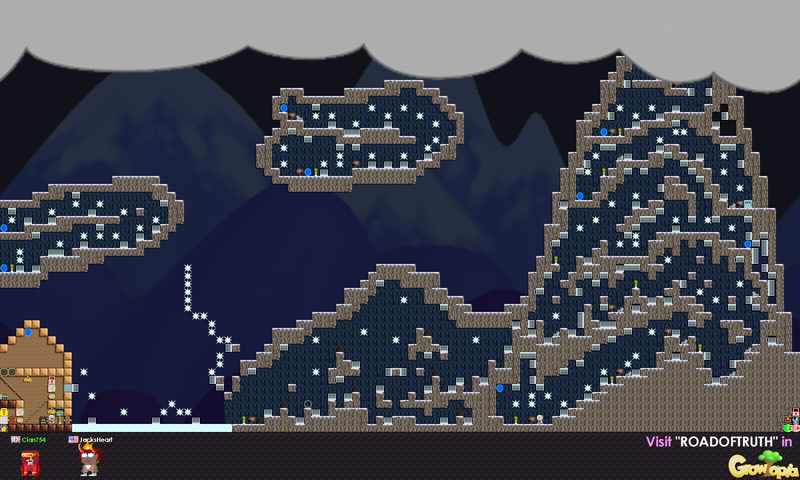 I’d like to nominate another world of mine which I built a while back, but it never won so I figured I’d give it another go. This world is quite simple, your objective is to find the 10-letter password which is hidden around the world and then eventually get into the VIP area. The world does have parkour in it as well as other elements for players to engage in, but I focused a lot on design of the world. Honestly, if you take a look in game I think you’ll be impressed. I know that I probably won’t win for a while now, but it’s worth a try I guess. Have an excellent day Neko! You can contact me if you have any questions/concerns, whether it be in-game or via forums. I'm commonly occupied with creating worlds and socializing with players! I would like to nominate my world about a father and his son who go on a journey together. Everything was fine until Jack (the small child) loses his father while climbing down a mountain. The rest of the map Jack tries to find his dad. The world is pretty difficult and a good challenge. My map includes a lot of high skill jump and run parts with individual jumps. As you work around the map adventure items which are reachable threw parkour try to make it more challenging. I also involved some password search parts which are not the easiest. Since i always enjoyed playing parkour especially WODT’s I decided to build my own one but after reading the boards at each parkour a lot of people were complaining about how easy it was. I feel like players want challenging parkours instead off easy mazes. The map focuses on different jumps but the design is pretty good too. I especially want to thank my friend who not only helped me build this world he also spent a tons of wls helping me out. I hope it is ok to have some vends before and inside of the parkour which can help us to get some wls back we spent. If it is not allowed to have vends in the world I could remove them. Abol we see it as a donation and we are both pretty noob. The map has PZ jammers a fire house and a ghost charm. I hope I win and good luck to all contestants. I have mad respect for every participant behause it takes extremly long to build a good world. The world is pretty difficult and a good challenge. My map includes a lot of high skill jump and run parts with individual jumps. As you work around thr map adventure items which are reachable threw parkour try to make it more challenging. I also involved some password search parts which are not the easiest. I hope I win and good luck to all contestants. I have mad respect for every participants behause it takes extremly long to build a good world. Last edited by MasterClemi; 04-17-2019 at 03:08 PM. World was built by I3UY and IBanb. The story of volcano is about a king, who wants to have all treasures of whole world. But he meets the king, whose is Wizard. The Wizard understands that king wants to steal his treasure, he murders him and curses the kingdom. The curse does his job: a volcano replaces the kingdom. Is the treasure still in volcano? Can you find it? I nominate EasterWeek2k19 for wotd! 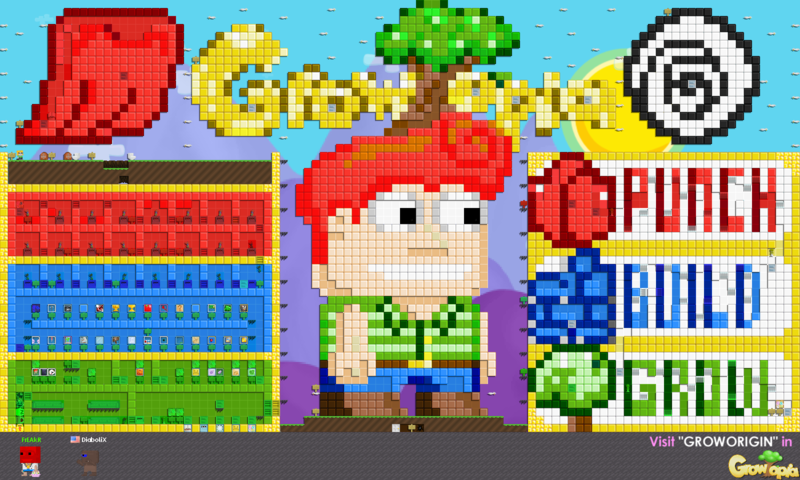 This world is all about Easter, Growtopian's are you finding a thrill world? Here's I'm offering my world to beat/finished this exclusive missing ways and adventure item's, Good luck with finding the way. Last edited by iiAri; 04-18-2019 at 05:14 AM. Reason: Forgot to say I had jammers on the top left. The rabbit king was old and could not rule his kingdom. So, he wanted to find someone who could replace him and be abtke to rule the kingdom well. Then the rabbit king ordered his troops to tell the rabbits that he was hiding his crown. A rabbit who can find his crown will be made king. However, the crown is hidden in a very dangerous place. The rabbit king deliberately hid it in very dangerous place to test their courage because to be king, they must be brave. Moca is a very brave bunny. His mother offered him to look for the crown. His adventure began. + PZ jammers, weather, and pineapple guarding to prevent cheating. + Game world for racing. + changed weather into something more fitting. + I added spoingers and pumpers where needed to make some places of the race not just running, but avoiding and jumping. + bulletin boards added beside the white door, one shows the credits and info about the world, the other shows FAQ, Also feedback board is added to the VIP room; to prevent spreading the password. Thanks To Jacksheart Who Helped to Build the world.